Taylor is the son of Labncroft’s Voices on the Wind (Von) and HRCH Maple Creeks Captain Morgan MH. We want to thank Bill And Marcia (Blindfaith Retrievers) for the opportunity to mate Von and Captain Morgan. Captain Morgan has one of the most outstanding pedigree in the retriever world today and his record is a testament to champions in his linage. 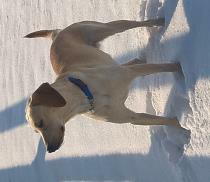 Taylor is an exception Labrador with plenty of drive, but an even temperament. Be sure to check out Taylor’s pedigree link. Brit is the 2013 son of Duckhill Sailer’s Return of Ogilvie and Duckhill Redhead Rita. Brit is a fox red Labrador, yellow by AKC standard. He is full British Import Pedigree with 34 Field Trial Winner and Champion credits to his pedigree. Brit’s pedigree also go back to Buccleuch Gem of the great Buccleuch kennel line of Drumlanrig Estate...one of the two foundation kennels of the Labrador breed. Be sure to check out Brit’s pedigree link. The first field trial for retrievers was run in 1899, but there were no Labradors retrievers on the entry sheet. The foundations of the Labrador breed can be traced back to two estates in Great Britain—Malmesburg and Buccleuch. The first Labrador to be recorded as taking a card at a trial was in 1904. His name was Munden Single and he was owned by Hon Arthur Holland-Hibbert. Munden Singel was almost pure Buccleuch and Malmesburg breeding, as was the first place winner in 1906 Major Maurice Portal’s FT CH Flapper. And, just before World War I, 14 field trial meetings were held and of the 247 dogs entered 179 were Labradors.